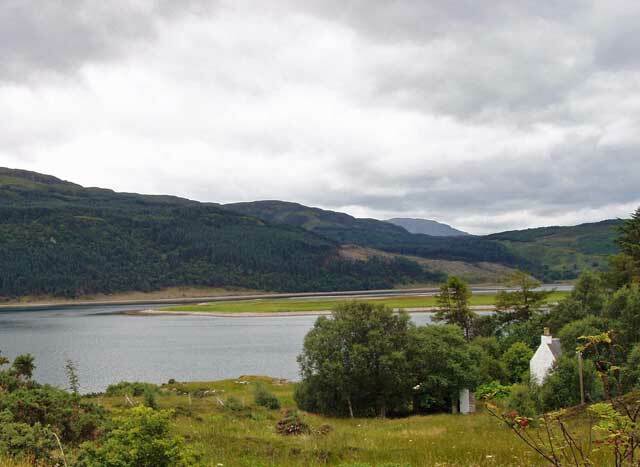 Set in a secluded position overlooking Loch Alsh this original croft house has reen refurbished by the present owners. 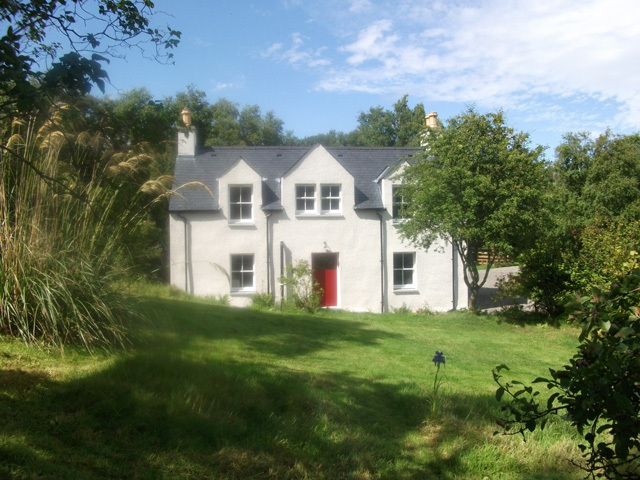 Beautifully restored and retaining much of its original character the property has reclaimed wood floors throughout and oil fired central heating for those autumn and winter nights. The owners have blended the old with the new and the house is furnished with an eclectic mix of modern and more traditional styles of furniture. 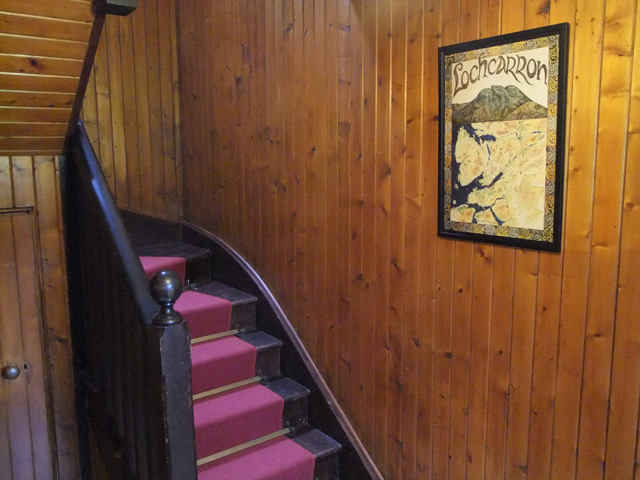 Downstairs guests will find a traditional layout with a central hall, still retaining to this day the original varnished wood linings and staircase. 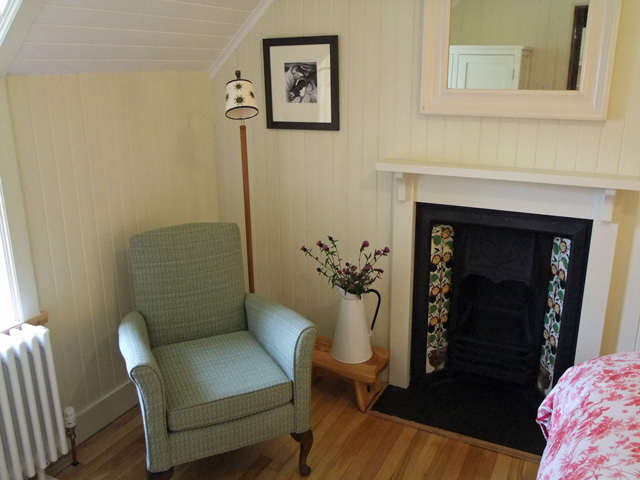 Off this hall is situated the lounge, tastefully decorated with comfortable armchairs and sofa, this room also benefits from a real fire, ideal for those nights relaxing after a day exploring. To the other side of the hall is situated the kitchen and dining area. 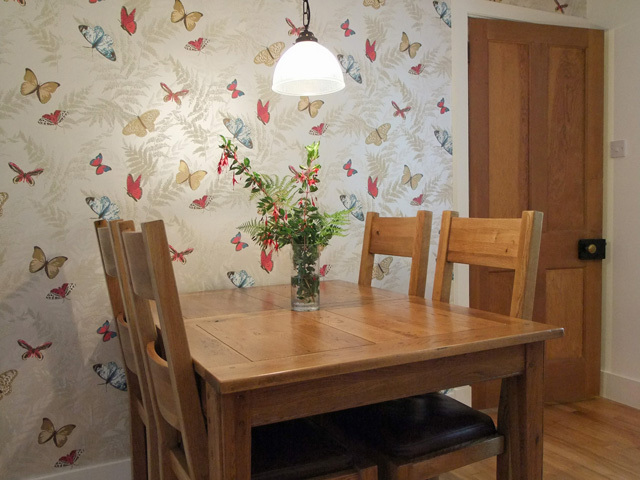 A couple of features of this room are the bright red Rayburn cooker and the feature wallpaper. 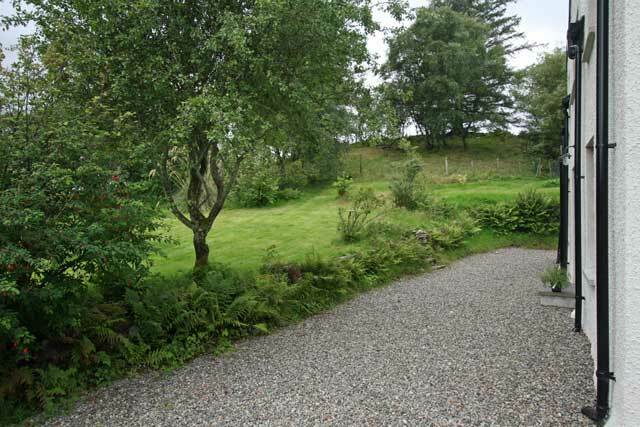 The kitchen is well equipped and has all the usual kitchen items expected. The owners have installed the latest music system in the downstairs rooms so that guests with ipods, MP3 players or a laptop, can simply plug in and listen to their own music through the built in speakers in either or both of these rooms, this also works with the TV with Freeview HD TV, Blu-Ray and DVD player located in the lounge. 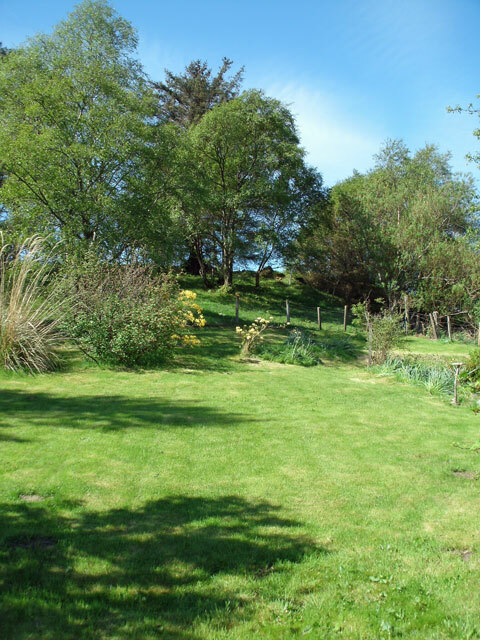 Upstairs guests will find two bedrooms, both south facing with views towards the loch. 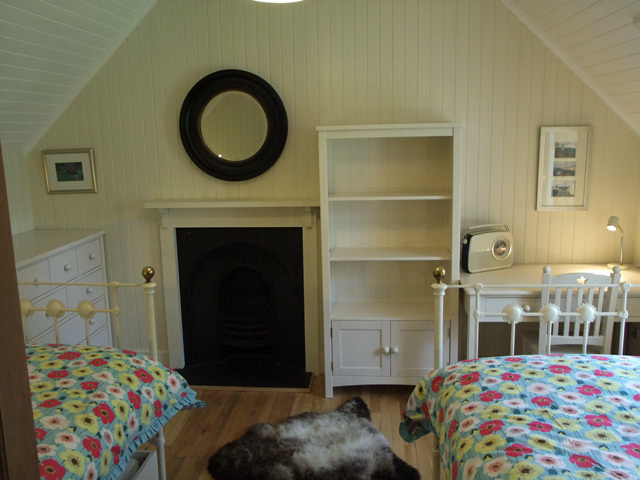 The bedrooms have cast iron fireplaces with pretty tile designs, stone hearths and wooden mantles. 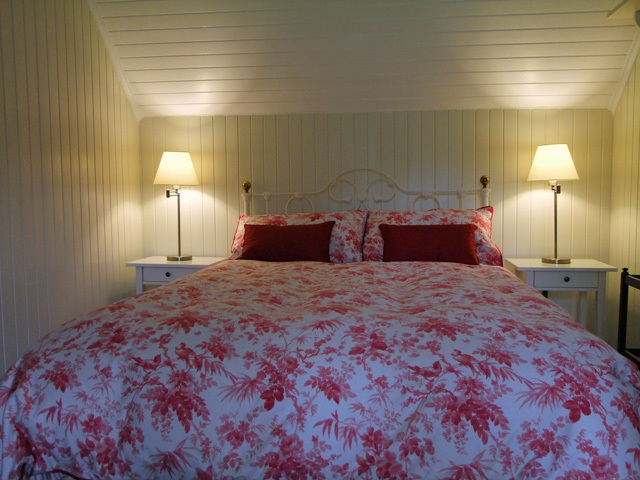 The twin bedroom has been furnished with traditional style cast iron beds and modern white painted furniture. 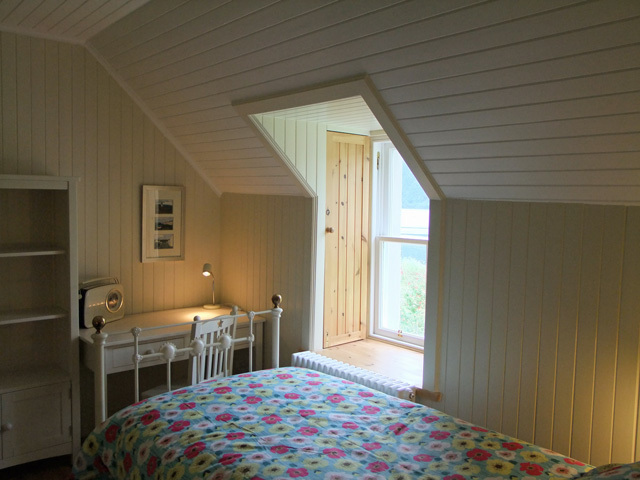 The master bedroom has a double bed and again white painted wooden furniture and benefits from having a quiet reading corner, ideal for enjoying the views to the garden and beyond. 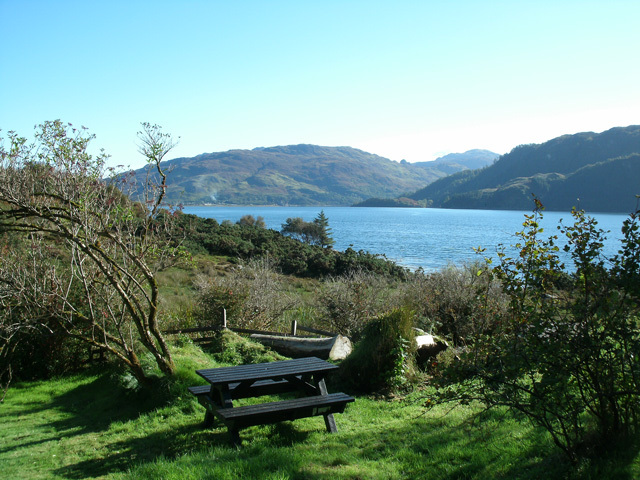 Outside an enclosed garden has garden furniture and views across Loch Alsh and towards Loch Duich and the renowned Eilean Donan Castle. The castle is probably the best known of all Scotland’s castles and has featured in many feature films. 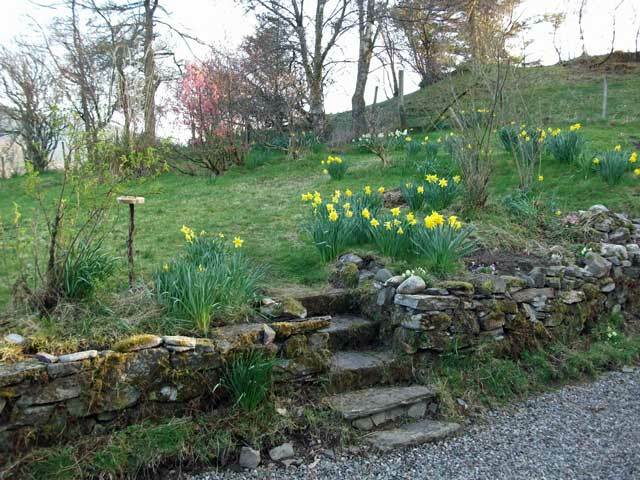 The Isle of Skye is within a twenty minute drive, the island often referred to as the Misty Isle is the largest and the best known of the Inner Hebrides, and offers something for everyone. 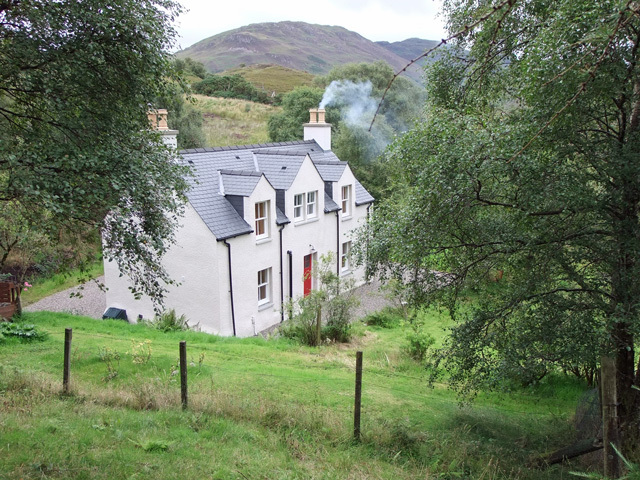 Now connected to the mainland by bridge, the scenery is stunning from the highest peaks and ridges of the Cuillin mountain to the white coral beaches and dramatic coastlines. 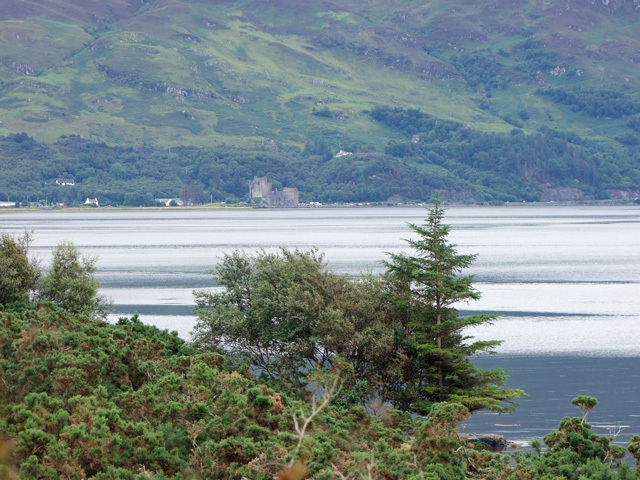 In the summer months an ideal day out would be to travel to the island by bridge and return over the sea by the skye ferry that runs from Kylerhea through the swirling tides to Glenelg on the mainland. 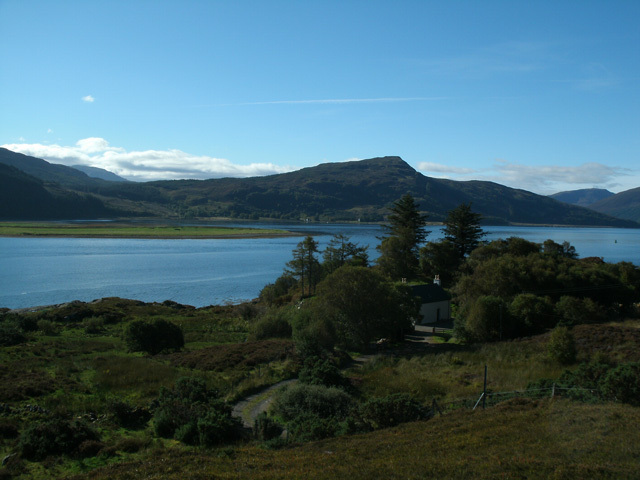 The largest population centre in the area is Kyle of Lochalsh, the small town has a selection of unique shops, and various cafes and restaurants. Whilst here why not enjoy a boat trip on the Seaprobe Atlantis, this glass bottom boat offers various trips and is an ideal way to see the local sea life and enjoy the coastal views. 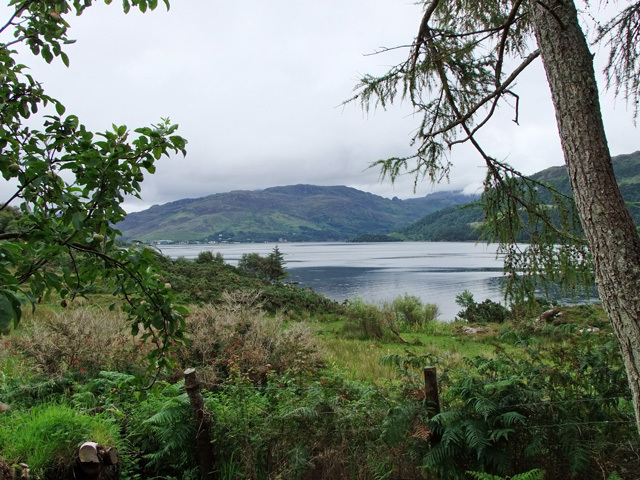 Travelling north the villages of Plockton with its palm trees and Loch Carron and Shieldaig are all worth visiting. En-route a popular choice for lunch or dinner is the Kishorn Seafood Bar, this small restaurant sells the best of the local seafood and is always a popular choice. 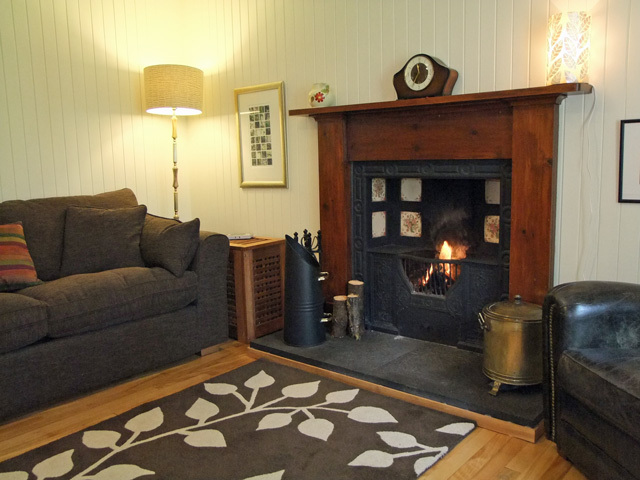 Cosy lounge with open fire, reclaimed wood flooring and wood panelled walls. 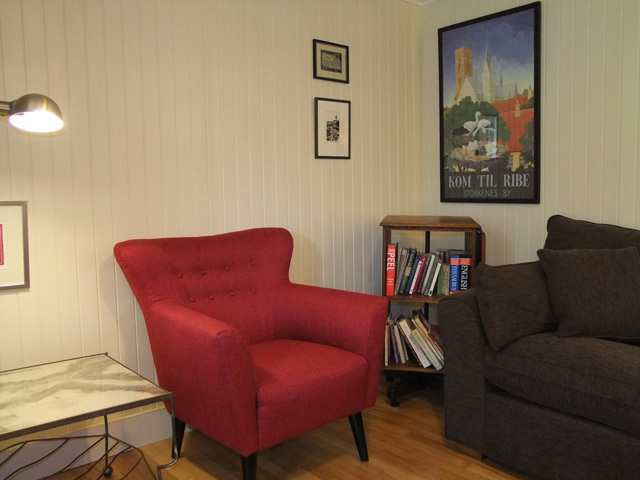 Sofa and arm chairs. Freeview HD TV, Netflix, Blu-Ray DVD player, selection of DVDs, WiFi access, HiFi system with speakers in the lounge and kitchen, internet radio, attachment for Ipods, MP3 players, laptops etc. A selection of books and games supplied. 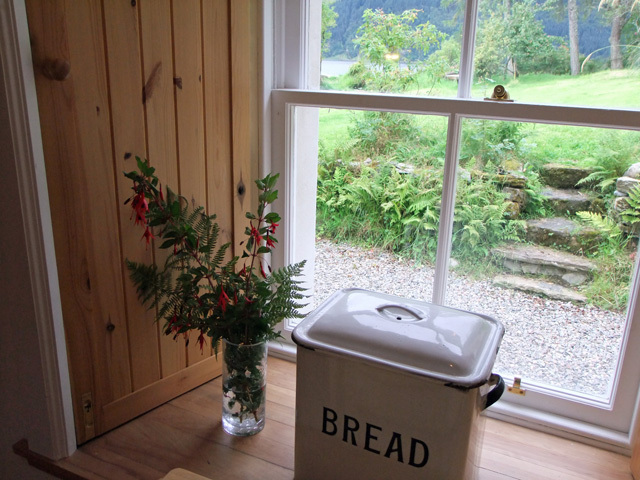 Window with traditional shutters overlooking the garden and Loch Alsh. 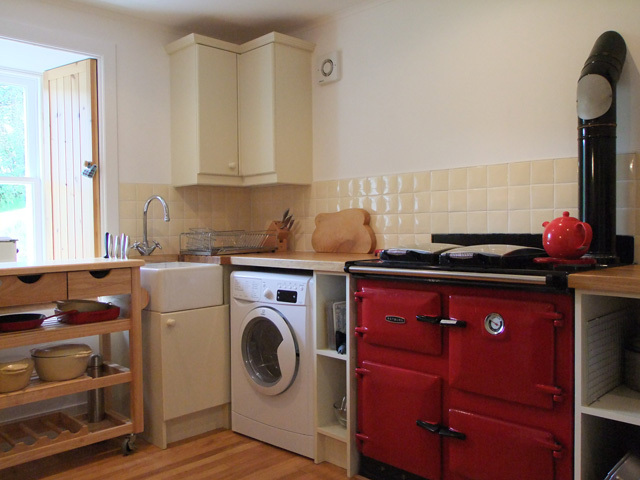 Kitchen/diner with oil fired Rayburn, fridge/freezer, washer/tumble drier, microwave and all the usual kitchen equipment. Ironing facilities, both indoor and outdoor drying available. 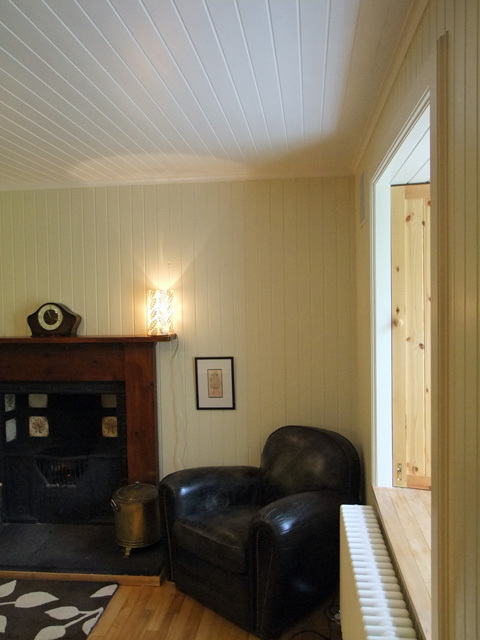 The window overlooks the garden and has traditional wooden shutters. 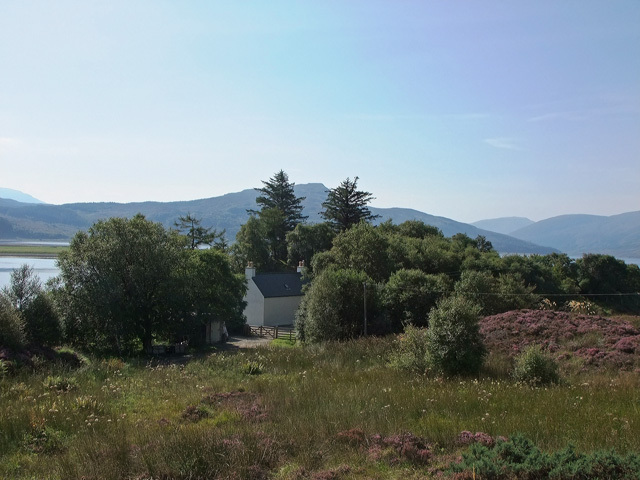 South facing double bedroom has a view over the garden and Loch Alsh. Hard wood flooring, traditional wood panelling to walls and coombed ceilings, cast iron fireplace and wooden shutters to the window. 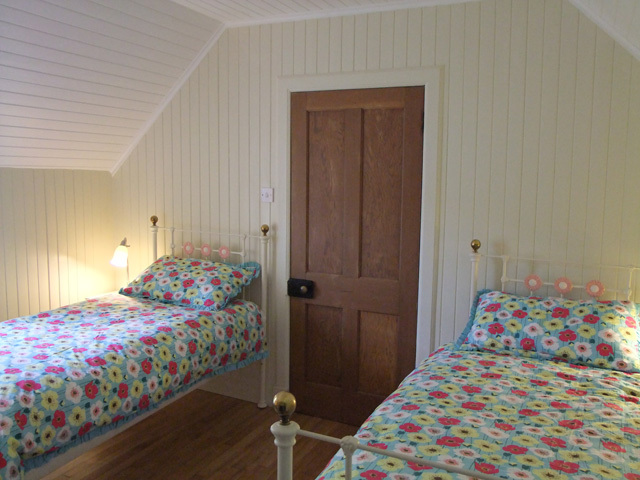 Twin bedroom again south facing with views over the garden and Loch Alsh. Hard wood flooring, traditional wood panelling to walls and coombed ceilings, cast iron fireplace and wooden shutters to the window. Hairdryer. Cot available. 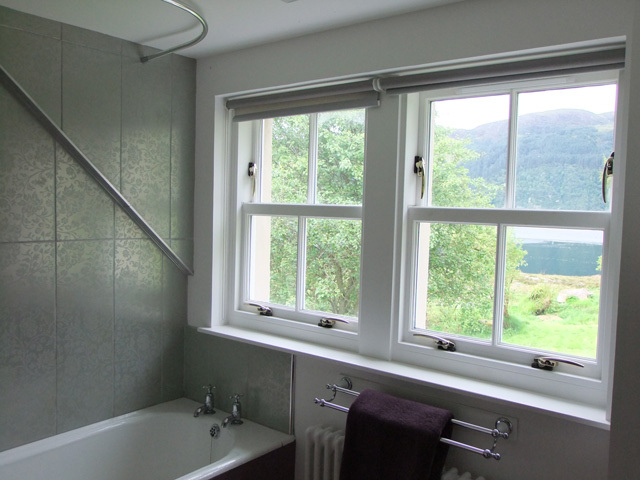 Bathroom with original cast iron bath and shower over, traditional wash hand basin and toilet. Outside shed available for bike, kayaks etc. Electricity, oil central heating and fuel for the fire. A perfect mixture between romantic en modern luxury. Delightfull panorama and the house itself is tastfully decorated, clean and equiped with the up to date audio, video and other luxury. A place to come at rest and to feel at home.